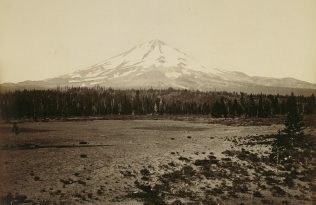 Best known for his pictures of Yosemite Valley and the nearby Mariposa Grove of giant sequoias, Carleton Watkins made his first trip there in 1861 just as the Civil War was beginning. Exhibited in New York for the first time in 1862, Watkins’s work tied the West to Northern cultural traditions and played a key role in making the once-wavering West a full participant in the nation. Motivated by Watkins’s pictures, Congress would pass and Abraham Lincoln would sign legislation setting Yosemite aside as a national preserve, the prototypical “national park” and the first such act of landscape preservation in the world. The below excerpt is from the forthcoming book, Carleton Watkins: Making the West American by Tyler Green. 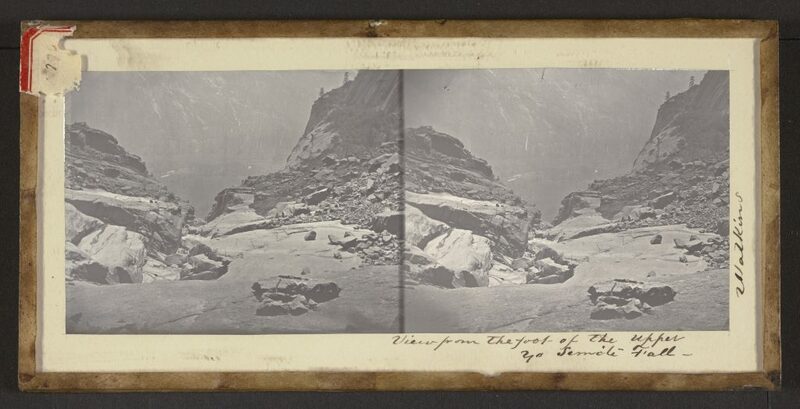 In the summer of 1867, as Watkins was sailing up and down the Columbia River, a tourist named De Witt Alexander visited Yosemite Valley. While Yosemite had emerged as a cultural Unionist project and had become a venue for the production of art and science, by the late 1860s it had finally become a significant tourism destination. As travelers do, Alexander wrote letters home detailing what he saw. Carleton Watkins, Lower Yosemite Fall, 1865–66. “About one half mile from Hutchings [Hotel] we climbed up a pile of fallen rocks for several hundred feet, and then followed a trail on a ledge in the face of the precipice some six hundred feet high. We had some ticklish spots to cross, where a stumble or slide might have been fatal,” Alexander wrote, detailing the arduous passage along a granite shelf that led a mile or so from Hutchings to the two halves of Yosemite Falls, a long stretch where the river tumbled down the rocks without quite waterfalling. Alexander was not exaggerating. The ledge he traveled was narrow, covered with fist-sized loose rocks, had little vegetation, and was rarely traversed. (Years later, the National Park Service constructed a trail on the other side of the falls in an effort to prevent people from using this dodgier route.) Alexander took this long ledge to a smaller one that overlooked the Lower Fall. 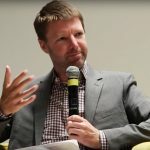 Instead of turning left and climbing down some perilous rocks toward the Lower Fall, he turned up through a steeply slanting crevice and climbed up to where the Upper Fall poured into an enormous granite shell. Carleton Watkins, View from the foot of the Upper Yosemite Fall, 1861. 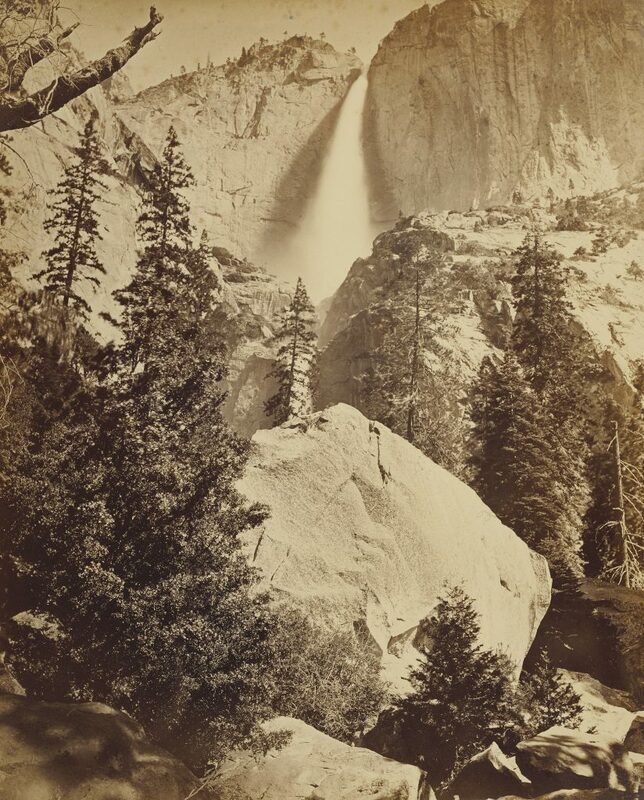 Carleton Watkins, Upper Yosemite Fall, 1865–66. 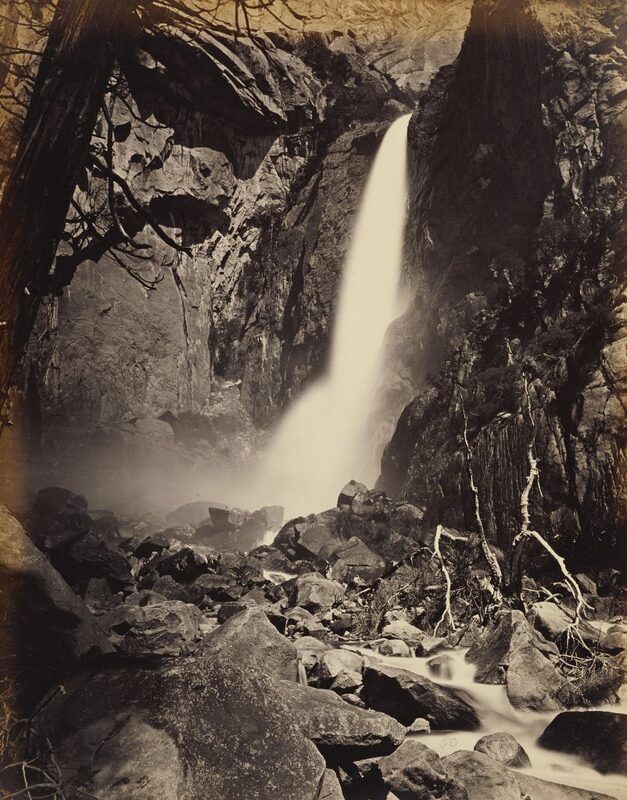 Such was Watkins’s fame that when a man boasted to his wife of the risks he took to reach the base of a waterfall, the three key elements of his retelling were his courage in the face of danger, the waterfall’s magnificence, and the fact that Carleton Watkins had been there. 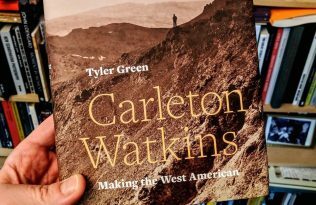 Carleton Watkins: Making the West American will be available in October—pre-order now online and save 30% with discount code 18W8495. 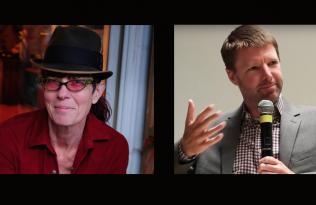 is an award-winning critic and historian. 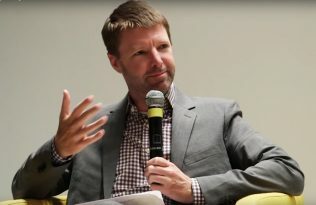 He is the producer and host of The Modern Art Notes Podcast, America’s most popular audio program on art, and was previously the editor of the website Modern Art Notes, which published from 2001 to 2014. This is his first book.